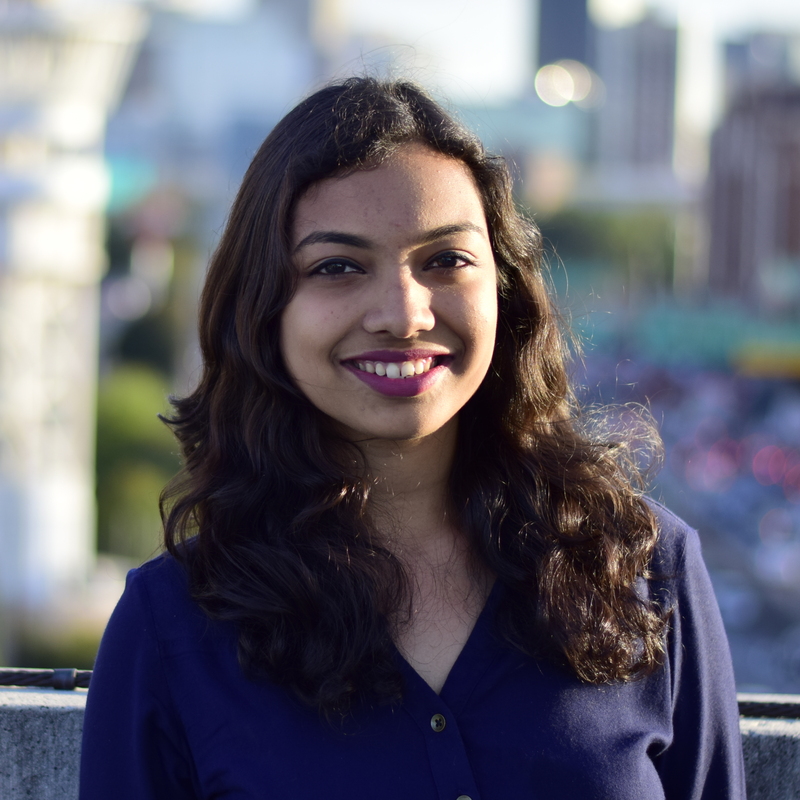 An app to help the caregiver monitor the patient's dosage, intakes and pill schedule and be alerted when a dose is missed. 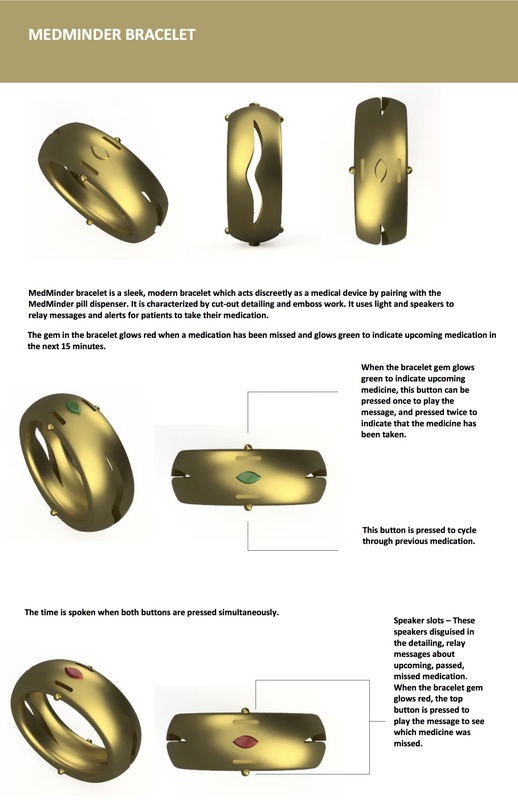 A wearable device which can be worn by the patient and discreetly alerts the patient when it is time for their medication. Scroll down to play with the working prototype! The caretaker/loved ones (especially those living away from the patient) and medical provider of the patient would use the mobile application. The patient would use the wearable device. 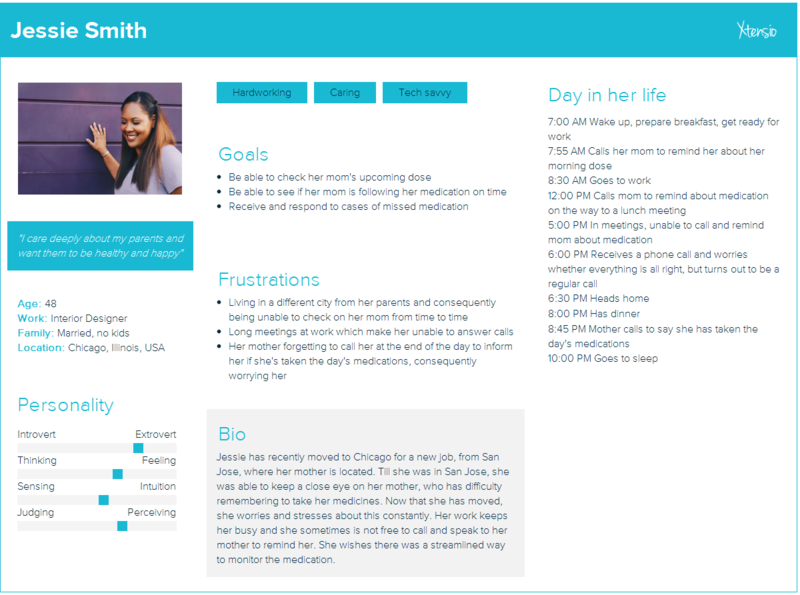 We came up with a user story and create low & medium fidelity mockups to illustrate how the app would be used by the caregiver. In my scenario, Robin, aged 29, is Sophie's daughter. They live on opposite coasts and share a strong bond. After visiting her over Christmas, she realizes that Sophie's health has deteriorated and that she forgets taking her medicines, but gets irritated at being constantly prompted by Robin to do so. As the doctor's visit results in additional medicines being prescribed, Robin is worried as to how Sophie will manage on her own. A friend suggests the MedMinder device, which can be filled directly by the pharmacist. Robin downloads the application, creates an account for herself and is immediately prompted to enter the patient's data with the device number. She configures her cousin as the emergency contact, since she lives in the same city as Sophie. Other setup includes adding the necessary medications along with the days and times, mapped to the correct pill box number and setting up emergency alerts. Sophie starts using the device and is quite pleased by how unobtrusive it is. One day, Robin gets an alert on her phone. She uses the call button from the alert to contact Sophie. As there is no response, the app prompts her to call the emergency contact, her cousin - who then checks on Sophie and reports back that she had gone for a walk and forgotten to take her medicine. Relieved, Robin modifies the reminder time for that medicine. The app also shows charts to indicate adherence, which the doctor views on the next visit. He is happy with the results, but not as happy as Robin and Sophie, for whom MedMinder has seamlessly become a part of life. Based on the caretaker profile, and the possible concerns they would have, I created a persona. The caretaker must be able to view and edit medicines as per the need. The caretaker should be able to have multiple patient profiles mapped to their account. In case of emergency, the caretaker should receive an alert - which denotes the urgency accordingly - and how intrusive the alert is can be modified by the caretaker. The caretaker should be able to configure settings in the pill box, like the dosage timings for example. The caretaker should be able to configure emergency contacts. I used ‘push left’ transitions for forward movements and ‘push right’ transitions for corresponding back movements. In places where I was moving to a new screen completely, like opening the MedMinder app from the home screen or opening a profile, I used the dissolve transition to indicate the change in context. For bottom navigation icon clicks, I used slide up transitions to give the illusion that it was emerging from the icons. 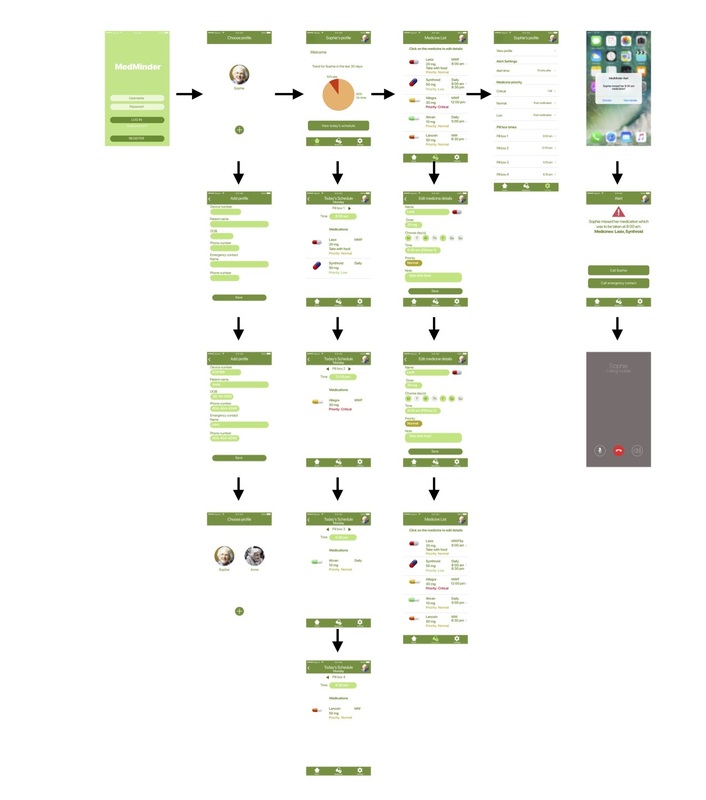 The final design was done with Sketch, with InVision for the interactivity. 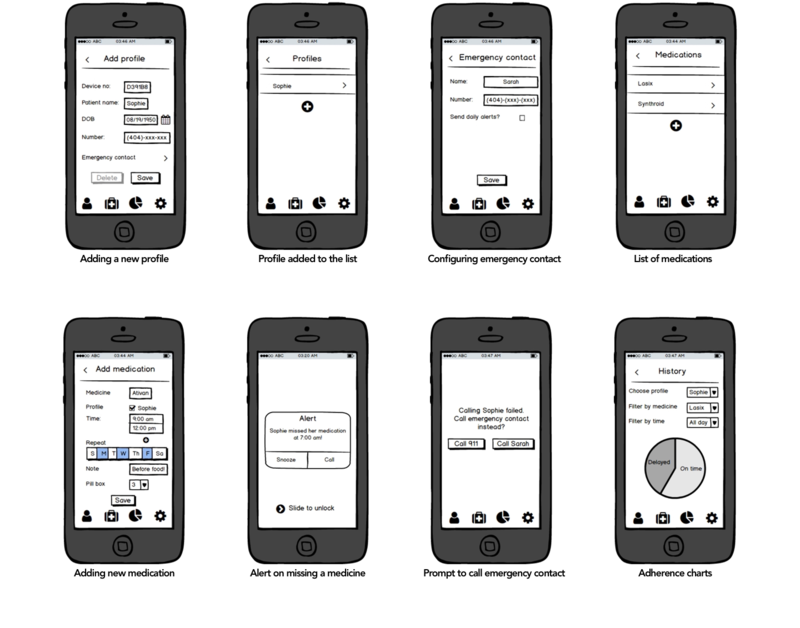 I conducted usability interviews with 2 users, for both functionality and interactivity of the prototype. There were 4 tasks: Add a new profile from the profiles screen. Go through the different doses of the current day’s schedule and find the 4th dose of the day. Edit the Lasix medicine to include it for Saturday. Contact your patient when they fail to take the dose. It should be possible to wear the device at all times. The device, even while alerting, should be discreet. 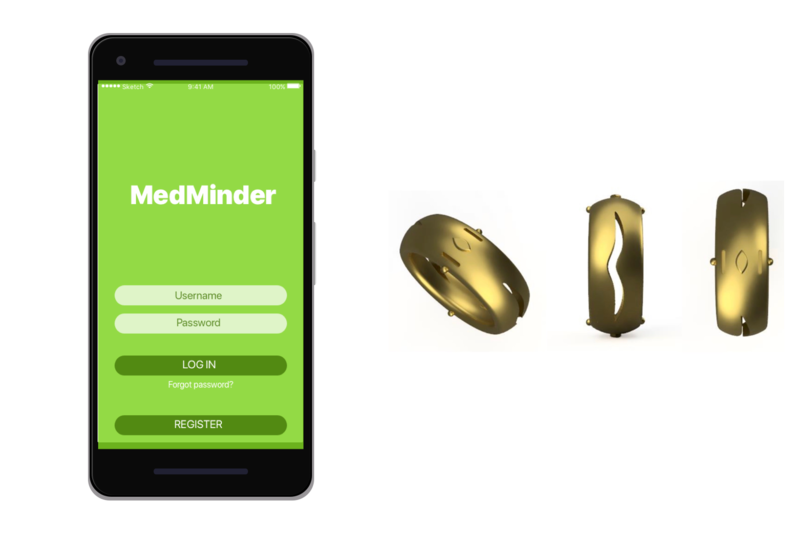 The device must alert the wearer of upcoming & missed medications. The device should be able to tell the time. The device cannot have a digital screen. The device should not be obstrusive for the wearer. 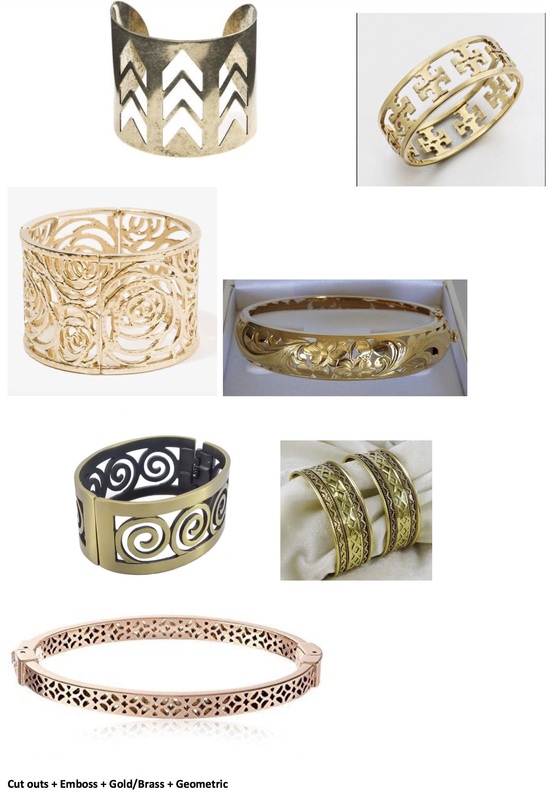 I made a moodboard to select a certain theme/style for the bracelet. The moodboard was a collection of pictures which was the inspiration for the look of the final device. Different user groups have widely different needs, and it is important to be cognizant of that. The same application, if it had been geared towards patients instead of the caretakers would be vastly different. The interactions built into an app need to reflect the consequent action. Sometimes, certain interactions do not fit with a particular context and would need to change. Creating a T-shaped prototype was a learning experience. It allowed me to explore all the features broadly, and dive deep into some of them.